Even on factory farms, where animals' lives are controlled in every aspect, the bonds of love between a mother and her baby cannot be broken. 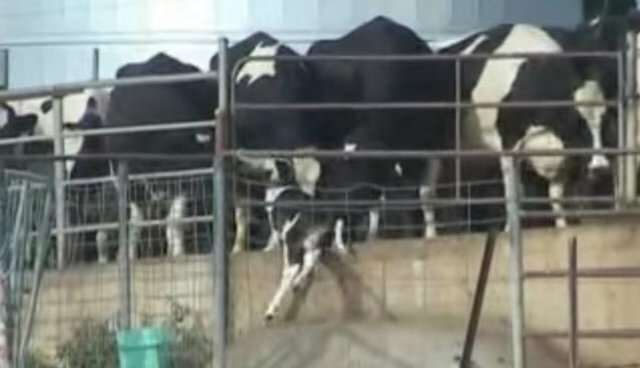 A video recently uploaded to YouTube, taken at an unidentified dairy farm, captures the heartbreaking actions of one baby cow who has been cordoned from the herd in preparation of being shipped away. Defying the boundaries keeping them apart in those final moments, the youngster is seen trying to reunite with his mother. The clip ends with the calf being carried off, though it's unclear as to where. In any case, however, it'll be far from his mother's side, where a youngster like him belongs. But sad as it is, scenes like this one are far from uncommon. Since cows must give birth every year to keep producing milk, dairy farmers invariably end up with many surplus calves. So, within hours of being born, they are separated from their mothers and sold. While this practice may be routine for the industry, for every calf that feeling of being apart from mom is new.